FAQ-What makes up a postage stamp? So you’ve decided to start stamp collecting…congratulations! The mark of any good collector is a thorough knowledge of the object of his interest. You will find that learning about postage stamps and all their difference aspects is something that can keep you busy for years to come, but it’s good to understand the basics. So, let’s start at the beginning-what makes up a postage stamp? What stands out under close examination? Gum: Most stamps are produced with gum on one side, with the exception of a few early issues (a person had to apply the glue his/herself). Traditionally, the gum used was water-activated (lick and stick). Many modern stamps are now printed with a self-adhesive backing (peel and stick). In the case of early stamps especially, the condition of the gum can play a large role in the stamp’s value. Re-gumming a damaged stamp can lower its value. An early stamp with pristine, original gum can greatly increase its worth. Image: The most visible part of a stamp is its image or design. Early stamps were mostly profiles or portraits of reigning monarchs in a frame, cameo or arch and containing decorative elements such as leaves, scrolls, crowns, curlicues and swirls. Modern printing and photography has led to more detailed images on the stamps of today and even allowed for the reproducing of famous paintings on these tiny bits of paper. Denomination: A stamp must always have a denomination printed on it. This numerical figure indicates the cost and postage rate of the stamp. Obviously, denominations change as the years go by and inflation increases. Many modern Canada stamps have a «P» (Permanent) denomination, meaning that you can purchase that stamp at the current postal rate and it remains valid even when the postal rate increases. The P-stamp is always worth the current domestic postage rate no matter what you paid for it at the time. Perforation: Sheets of stamps have rows of tiny holes punched in them in order to make the stamps easier to separate one from another. Once separated, the stamp has what looks like wavy teeth along its edges. Some older stamps are imperforate, in other words they were probably cut with scissors to separate them from one another and therefore have straight edges. All perforations can be measured with a special tool called a perforation gauge. Two stamps can look exactly the same but be completely different because of their perforation measure. Some stamps can be more rare and valuable than others simply due to their perforation measure. There are different kinds of perforations: sewing machine perforations, rouletted, line perforations, comb perforations etc. Many modern, self-adhesive stamps are die-cut; the shape of the entire stamp is cut out with one stroke. Die-cut stamps can have straight edges, or be cut in such a way as to simulate torn perforations. 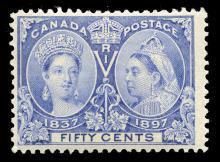 Colour: The same stamp can have many different colour variations, especially with early stamps. For example, Canada stamp #106 was printed in carmine, pink, rose carmine, deep rose red, dark carmine, orange red, deep red and ……..red! These subtle colour differences can be difficult to detect. You can buy a stamp colour guide (such as the one made by Stanley Gibbons) to help you figure out what you have. A stamp with a certain colour can be more rare and valuable than another. Of course, there are many other things that make up the identity of a stamp, but this should help you with the immediate basics. Check back soon for a more detailed explanation of some of the characteristics discussed here today. British Guiana 1¢ Magenta Breaks World Record! Canada 1851 12d black mint stamp for sale!